Part of the winning team accepting the 2013 Gordon Bell Prize. IBM Blue Gene systems have helped map the human genome, flown airplanes, pinpointed tumors, predicted climate trends and we can now add simulated bubbles to the list — more precisely 15,000 of them. But this isn’t child’s play, in fact the research achieved a new supercomputing record and last night it was awarded the prestigious 2013 Gordon Bell Prize. Why bubbles? It turns out that when bubbles burst or cavitate, in scientific parlance, they can be very destructive, causing tremendous damage. Look closely at a motor boat propeller and you may see thousands of dimples on the metal caused by bubble cavitation. But scientists at ETH Zurich, the renowned Swiss university, and IBM Research, in collaboration with the Technical University of Munich and the Lawrence Livermore National Laboratory (LLNL), have bigger ideas than just improving industrial technology. 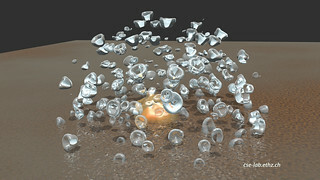 When harnessed, these violent bubbles can also shatter kidney stones and destroy tumorous cancer cells. It’s all part of the field of fluid dynamics but, due to the short time scales involved with moving liquids, its quantitative understanding has been elusive for experimentalists and computational scientists. That was until scientists at ETH and IBM were given the challenge to simulate cloud cavitation collapse (the simultaneous bursting of thousands of bubbles) and granted access to one of the fastest supercomputers in the world, the IBM Blue Gene/Q “Sequoia” at LLNL. 15,000 bubbles simulated in a new record. Achieving a new record, the team simulated 15,000 bubbles at 14.4 petaflops of sustained performance — 73 percent of the supercomputer’s theoretical peak. This is a 150-fold improvement over previous research in fluid dynamics. This record-breaking research was awarded the 2013 Gordon Bell prize, which recognizes outstanding achievements in high-performance computing. 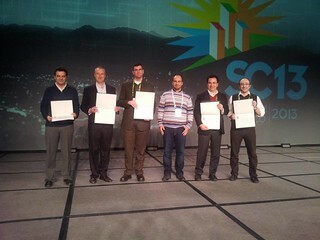 “We were able to accomplish this using an array of pioneering hardware and software features within the IBM Blue Gene/Q platform that allowed the fast development of ultra-scalable code, which achieves one order of magnitude better performance than the previous state of the art,” said Alessandro Curioni, head of the Mathematical and Computational Sciences department at IBM Research – Zurich. The scientists hope the attention attracted by the award will open up new opportunities to collaborate with medical doctors to further explore the applications of bubble cavitation in healthcare.